Thick of action: Sandy Flockhart, chief executive officer and global head of commercial banking, HSBC. The chief executive officer and global head of commercial banking of Hong Kong and Shanghai Banking Corp. Ltd (HSBC), Sandy Flockhart, on Thursday said the strategy of the bank is to make India, along with other emerging market peers, contribute to 60% of the group’s business over the next six years. Currently the emerging market economies contribute to about 50% of the group’s business and India is among the top 10 contributors. Flockhart said the Asian economies are in a growth phase and compared with its peers, India, is one of the fastest growing economies. The greatest challenge in all Asian countries, he said, is “talent management," which HSBC takes seriously. The Indian arm of the bank is hiring an additional 5,000 people in 2008. The current staff strength of the lender stands at 31,000. 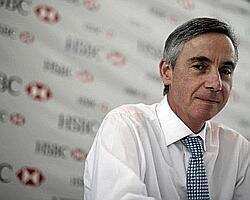 Flockhart sees HSBC in India catering to the middle class which has “more need for banking services." He said India has “good demographics" and HSBC will be present in every aspect of retail banking to cater to this segment of the population. HSBC has invested $1.7 billion in its India operations so far. It will infuse capital in its India operations as and when required, in addition to retaining profits, Flockhart added. He sees opportunity in the equity capital markets because “markets in India have gained more depth." According to Flockhart, the primary market in India is strengthening as there is a “steady rise in IPOs by Indian corporations." HSBC in India is not ruling out the possibility of “an acquisition of a local brokerage firm, given the price and opportunity is right for the bank," Flockhart said. He also sees HSBC gaining strength in areas such as asset management and insurance. HSBC already is among the top 10 players in asset management in India, managing assets worth Rs16,847 crore. “Given the pace at which the Asian economies are growing, HSBC will intensify the pace of its organic growth," Flockhart added. Flockhart is happy with the organic growth in its consumer finance business that the bank launched in India about 18 months ago. Called Pragati Finance, the plan caters to what the bank defines as “near- prime category" and gives small-ticket loans to those who have not had access to formal credit. Flockhart is optimistic about this business in India and said there are no parallels to be drawn from the sub-prime crisis in the developed markets such as the US. HSBC globally has written off $5 billion as losses from the subprime crisis. HSBC India reported 64% rise in net profits for the year ended March to Rs846 crore from Rs515 crore in the year-ago period. As of March, HSBC had a deposit base of Rs34,825 crore and advances of Rs23,142 crore.